The SAAF Forum • View topic - Project Cava? Post subject: Re: Project Cava? Talking of Mirage 2000, I remember David Fabish working at Denel circa 1986, my last year of vacation work there. Very nice work there Mamba . I'll go with that as an XDM (Experimental Development Model) so please can you give us an ADM (Advanced Development Model) version converted with double delta wings and wingtip missile rails. A niggling thing in the back of my mind makes me think that's how the wing would've been designed. 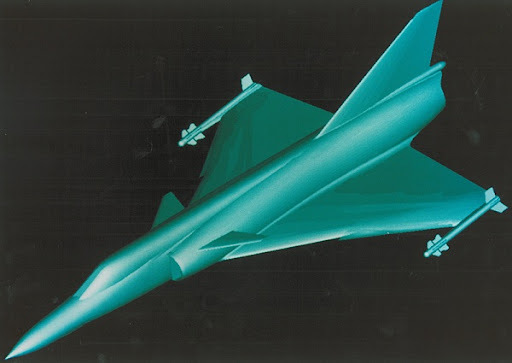 I have a nice computer generated image of a Cheetah C with this type of wing plan and this may have been a precursor to Cava's wing configuration. Thank you guys! Glad she has had a good reception here. I have a few other SAAF things I might post in the future. Those canards look smaller than the normal C canards? To make the timeline correct this particular image come from after Carver was cancelled and we switched to design excercises of Cheetah wing upgrades ultimately resulting in what we called the "advanced combat wing"
The small canard is the "70%" canard of the Cheetah E and D's The Cheetah C had the full sized Kfir Canard. An interesting thing I discovered, being in Switzerland, is that one ex Swiss Mirage Jockey told me that the Swiss invented the 70% canard (which was put on all the Swiss Mirage III's) and sold the idea to the SAAF. It had the advantage is that no structural reinforcing of the fuselage frame was needed for the smaller canard and it was just as effective.